Chatter-free performance in deburring, chamfering and countersinking. Circular clearance eliminates snagging or seizing. Ideal for low horsepower or hand-held applications. Unequalled performance in deburring, chamfering and countersinking operations. Precision engineered to cut most metals and plastics without chatter (not recommended for aluminum bronze applications). Self-piloting, self-centering action for free-cutting, low torque deburring and consistently concentric chamfers and countersinks. Uniform smooth surface finishes with no secondary burr. Controlled radial relief for positive, chatter-free engagement even in light deburring / chamfering operations. Constructed from high speed steel, heat-treated and precision ground for dependable operation. Compatible with lightweight machine tools and portable drill motors. Easily re-ground (cylindrically) without special grinding equipment; no cam grinding or hand relieving necessary. 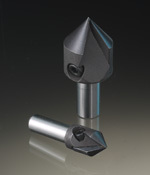 Carbide-tipped tools available for highly abrasive or difficult-to-machine applications. Wide range of configurations for specific needs. Two cutting edges for double life in tools up to 1 capacity; a single cutter in larger tools, 1-1/2 and 2-1/2 capacity to meet low torque requirements. High-rake shear angles for minimal cutting pressure. Circular clearance provides controlled entry, eliminates snagging or seizing.